Agency of the Year – Small Agency National Recruitment Federation 2011 Award winner is Recruitment Plus. This category was sponsored by ICON accounting. The winner of this category impressed the judges very much due to their innovative approach to the business. Their commitment to the customer came across very strongly. Internally they embrace the work life balance and the longevity of the staff was testament to this culture. Professionalism shone through hence why they were declared the winner. 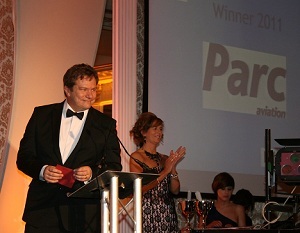 Parc Aviation is the Best in Practice National Recruitment Federation 2011 Award winner for a Specialism. This category was sponsored by Arithon. For this award the judges took account of the size of an agency, what the specialism was and why it stood out from the other applications when making their decision. The winner was selected by the judges because they showed whilst they operated in a niche area their commitment and dedication to meeting the clients and candidates needs was very evident. Their commitment to their staff development and the clear road map they have of how they go about their business is very prominent. Sigmar won Best in Practice National Recruitment Federation 2011 Award for Office & Secretarial category. This category was sponsored by Broadbean and presented by Shaun Weiss. The judges found this category to be very narrowly contested with the winner scoring just a few extra points for their understanding of their target market. The winner stood out because they demonstrated how they operated in this sector, how they knew their target market and the innovative approach they used to obtain new business. Best in Practice National Recruitment Federation 2011 Award for Office & Secretarial category went to Osborne Recruitment. This category was sponsored by Gary Irwin Solicitors. The judges selected the winner in this category because- They were not trying to be all things to all people or markets, but concentrated and focused on what they were good at in this sector. They demonstrated the long-givity of the Agency and Client relationship and the value of what they offer to clients and candidates. The strong relationship and investment in internal staff and processes was very evident. Careers Register wins Best in Practice National Recruitment Federation 2011 Award for Accountancy & Finance category. This award was sponsored by Brennan Insurance in association with Hiscox and presented by Eamonn Doherty. Another category where the judges were blown away by not only the number of entries but the quality of this sector entries. The winner was narrowly chosen from the rest because of their well rounded submission. They portrayed themselves as a leader and innovator especially in the Candidate section, how they worked with and the support they offered to get the unemployed back to work, the achievements over the past year, and how they have positioned themselves in this area. Best in Practice National Recruitment Federation 2011 Award for Healthcare went to Servisource. This award, presented by Fergal Lennon, was sponsored by CXC Global Exchange. The winner of this category was chosen for their innovation in a number of areas. Mobile training, developing new models for their Clients, and the development of new processes to enable them to spend more time with Candidates and Clients. The judges also noted the Company instilled and encouraged a sense of pride in their staff.